Today I completed a full inspection of my bee hive. I introduced the package two and a half months ago at the beginning of June. I was keen to have a look at what was going on as I had re-started feeding at the beginning of August to encourage the bees to go up into the new super. Since then they have been sucking up the syrup – but refusing to start on the super! 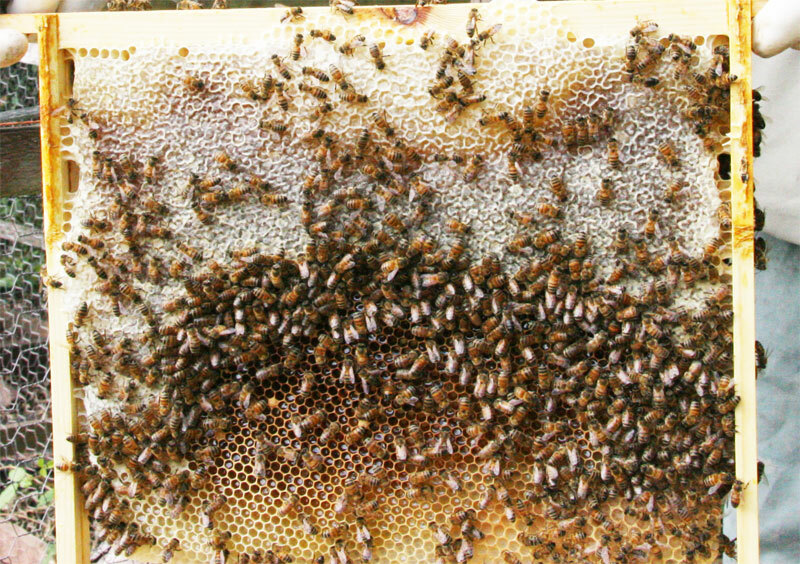 Looking in the super, the only comb present was on a mid frame where the bees had started building from the bottom bar, upwards. So far it was small so I removed it and put it to one side. 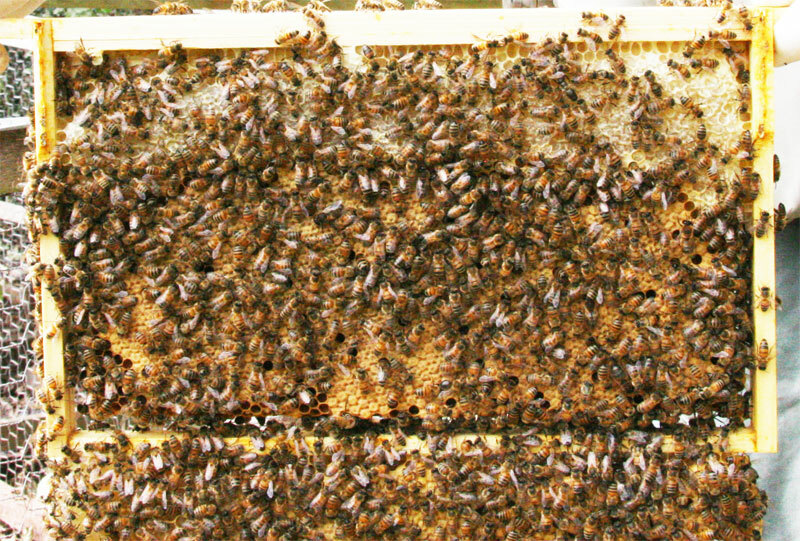 I had to remove some burr comb between the bottom bar and the top bar of the brood frames below. The brood box was very full of bees and comb. I have squeezed in 13 – 14×12 frames and this was causing some problems on the last two frames. I had to lift them out together to remove them. 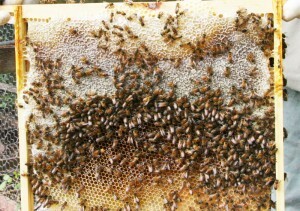 The rear most frame comb was full of honey/syrup and was slightly damaged. I put this to one side also. The rear most frames where pretty much all honey and pollen, a good nest pattern could be seen as I moved forward through the frames. 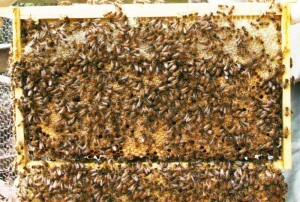 The image on the right is frame 4 near the front of the hive. I used a medium frame and let the bees “extend it to a 12×14! The benefit for me is that it is much easier to transfer into a medium box ( should it be necessary). I shall be moving all my 12×14 frames to mediums as I try “standardise my equipment. Continued inspection showed increased stores, this would be mostly syrup but also honey. As I moved forward there was increased covered brood. There were also some drone cells at the bottom of the frames. Everything looks good. I used the salvaged comb I had put aside to make up a medium frame and inserted it into the middle of the super. I hope this will draw them up and that they will start building more comb. The hive has no spare comb in the brood box and the bees need to get on building comb so that they have the space to harvest the september ivy flow. 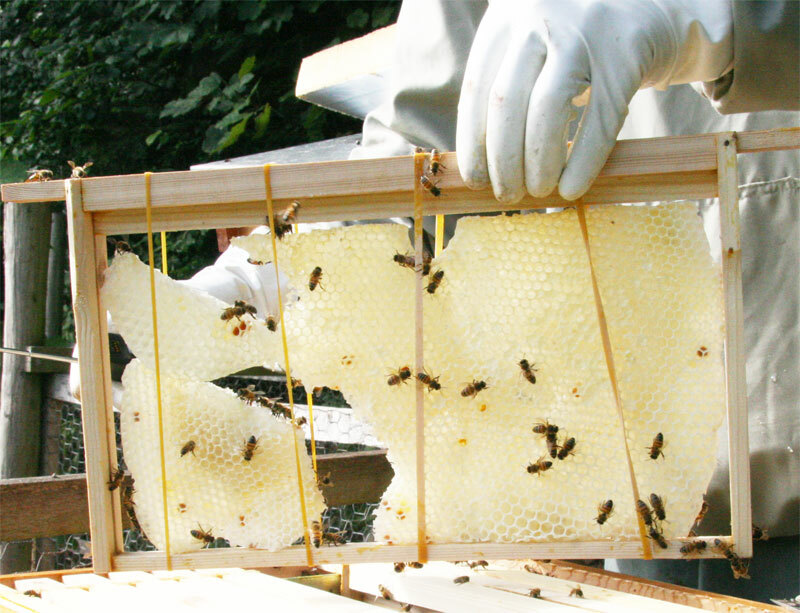 I’ll do a quick check and update in a few days to see how the bees are doing and to remove the rubber bands and feeder. This entry was posted in Diary on August 24, 2013 by george.